HE Minister of Information and Communications Technology Dr. Hessa Al Jaber met Tuesday with Turkish Deputy Prime Minister Bulent Arinc. During the meeting, the two sides reviewed mutual cooperation ties in the sector of information and communications technology and means of enhancing cooperation in its small and medium enterprises. 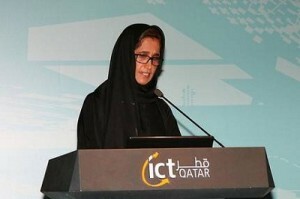 Dr. Al Jaber accompanied the Turkish official in a tour around Qatar’s annual ICT conference and exhibition (QITCOM 2014), which is organized by the Ministry of Information and Communications Technology between May 26-28 at Qatar National Convention Center.